Back in September, we came away with three points from Lincoln having won 1–0, but this time it was always going to be a difficult ask to win a game against the current leaders and favourites to go up as champions at the end of the season. Lincoln City were far stronger, quicker and had the guile to out-think the home side. What chances the home side made they were easily dealt with and it was surprising that it took the visitors 36 minutes to take the lead. Glenn Morris was again at his best and couldn’t be criticised for any of the three goals conceded – John Akinde was well marshalled by Bondz N’Gala not allowing him to get any worthwhile efforts on target. Lincoln’s midfield were the best seen at the stadium this season, closing down and making the home midfield look ragged. 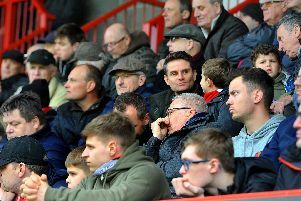 The 3–0 defeat was in front of the largest league attendance at the stadium this season, 3355, which included over 1059 travelling supporters who were far the more vocal throughout the match. Unfortunately that was the first time that Lincoln City had ever beaten Crawley in four matches since their returning to the football league. Where does that leave the Red Devils – seven matches remaining, nine points above the relegation zone with some six pointers - next Saturday away at Morecambe, then also coming up Yeovil away and Notts County at home on Easter Monday. All winnable games but also losable, with the current form it doesn’t look good. On the positive side, both Macclesfield and Notts County still have some difficult matches in their run in – and they have to go on a promotion run of form to jettison themselves away from the threat of relegation. 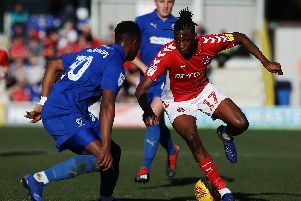 Crawley need two wins in the final seven games to be certain of survival. It’s all very worrying for supporters who have gone through is ordeal for the past four seasons. We have to believe that the team somehow will pull through. Next away travel: Our first overnight trip is this Saturday to Morecambe. It’s not too late to book on and come to support the team, we have seats on the coach and can still get rooms for this trip. We depart the People’s Pension Stadium at 6am and travel to Morecambe arriving at midday, we then book into the Clifton Hotel and the rest of the day and evening is yours – we depart after breakfast on Sunday, arriving back in Crawley for about 4pm – Cost for this trip is £70 includes the B&B and coach. Sorry we will not be organising transport to go there and back in the day.